The Cape Hatteras Lighthouse Oval Stained Glass Suncatcher measures 10 3/32 (25.6 cm) tall, and 8 inches (20.3 cm) wide. 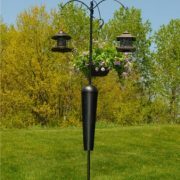 The stained glass piece can be hung in a window and a chain is included. The Cape Hatteras Lighthouse Oval Stained Glass Suncatcher weighs 14.2 ounces (403 grams) and comes securely packed in Styrofoam. 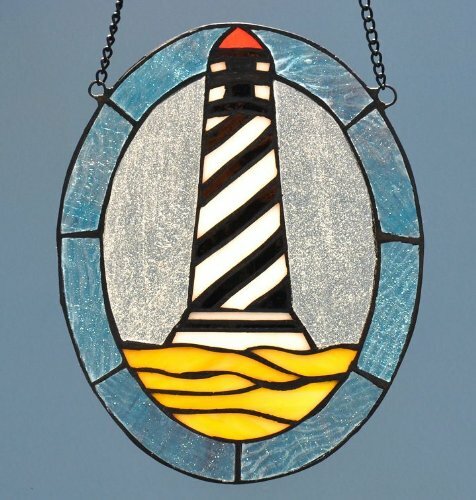 This affordable nautical oval stained glass piece depicts the famous Cape Hatteras Light, located on Hatteras Island in the Outer Banks of North Carolina. The Cape Hatteras Lighthouse is recognized by the National Park Service as the tallest lighthouse in America. This is not cheap painted glass that flakes and fades over time. This is true stained glass, handmade from individually cut vibrantly colored art glass, held together by hand soldered strips of copper. The Cape Hatteras Lighthouse Oval Stained Glass Suncatcher is usually $100, but is now only $59.